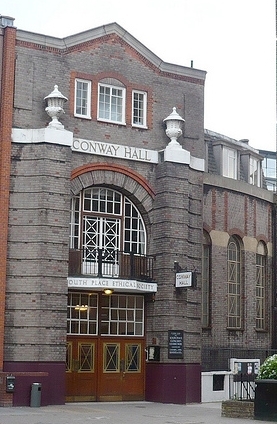 Last Sunday (10 September 2017) the Conway Hall Sunday Concerts, director of music Simon Callaghan, started the 2017/18, providing chamber music lovers with their weekly fix. Sunday's opening concert was the Tippett Quartet with pianist Emma Abbate in Schumann and Dvorak's quintets. On Sunday 17 September the series continues with the Brownell Trio in Beethoven's Archduke Trio and trios by Hummel and Franck, with the Zelkova Quartet in Haydn, Beethoven and Debussy the week afterwards. Further ahead, there is the final of Fulham Opera's Robert Presley Memorial Prize with a group of young singers singing arias by Verd in front of a jury which includes Sir Thomas Allen, David Syrus and Pamela Kuhn. And Music in Motion returns with John Landor directing the Gildas Quartet in an intriguing programme of chamber music with movement. The Monte Piano Trio's concert will give us a chance to hear Amy Beach's Trio Op.150 alongside trios by Beethoven and Dvorak, whilst the Nous Quartet brings an Italian themed concert with quartets by Boccherini, Verdi and Respighi. The Odysseus Trio is performing Bloch's Three Nocturnes alongside trios by Mozart and Brahms, and the Ligeti Quartet is combining Purcell, Stravinsky, Haydn, Ligeti and Bartok. From unusual repertoire to unusual instrumental combinations, violinist Harriet Mackenzie is joining guitarist Morgan Szymanski for a programme which mixes baroque music with De Falla, Sarasate and Piazolla. On November 26, Julian Perkins and Sounds Baroque are giving a programme which combines songs by Purcell with music by Draghi and Corbetta, and a contemporary piece by Stephen Dodgson. I will be giving the pre-concert talk to the programme. And in December, the series artistic director Simon Callaghan joins the Jubilee Quartet for Schnittke's Piano Quintet in a programme which includes music by Haydn, Stravinsky & Beethoven. In addition to pre-concert talks, this season some concerts have pre-concert recitals, with short recitals from young artists at 5.30pm.